The weather stayed really mild all week and we had a fair bit of rain which put some colour in the river but it didn’t last long. It was a very foggy morning as I headed to the Oak for the draw and all the normal faces were there. Looking at the section boards, I didn’t really mind where I drew with the exception of peg 120 which has been poor the last few times it’s been in. The golden peg was drawn and today it was H4 and as it won last week, there was a good chance of it going today. Adie and John both had short draws ending up on 126 and 108 respectively, I think Adie is getting Wi-Fi installed on 126 as that’s the fourth time he’s drawn it! I hung back hoping somebody else would pull out 120 but my master plan failed miserably when nobody did and as I stuck my hand in the bucket there was only one ball left and it was the one I didn’t want. Elsewhere Steve P drew the golden peg and Rob was on H1 again so at least he wouldn’t need to adjust his rigs from last week! 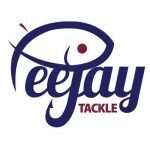 Fieldy drew 106 and wasn’t too impressed despite Justin doing 16lb of chub and roach off it in the previous match! John followed me to the river as he hadn’t been to Redbridge before and I showed him where 108 was although he also had the choice of 109, he decided on the former and as I walked past 109, I gave it a longing look as I’ve never drawn it and I fancied it today. I also walked past the swim above the wires and it’s a swim I think we really ought to try as it looks really fishy with loads of features. I finally reached the weir pool and I have to say I was puffing a bit but it did look nice. Peg 120 looked lovely but it hasn’t broken 2lb for a few weeks! 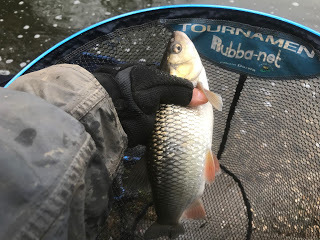 I got myself comfy and set up a 1.5 gram Drennan Carbo for fishing the deep water and a 1 gram bodied float for the tail of the swim, both rigs had size 18 Kamasan B611’s to 0.10mm and on the side tray I had Bait-Tech Super Seed Hemp, maggots and casters. 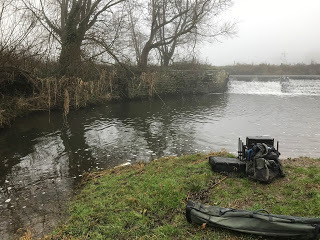 I had a quick coffee and then it was time to start, I slipped two red maggots on and started at 8.5 metres straight out in front in the deep hole as the last time I was here I caught really well from the off. No indications there this time so I started inching the float through in the flow to my left, the float dipped before sliding away and I swung in a small dace. Next chuck I had a chublet followed by another dace, then a gudgeon and it felt like there were a few fish there. 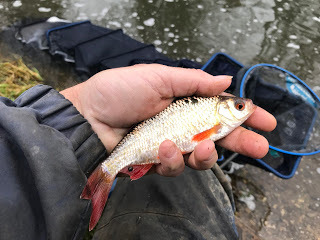 I had seven fish after the first half an hour, then I hooked a slightly better fish which turned out to be a surprise golden rudd! I added a couple more small fish and was enjoying myself but then bites just tailed off, I wasn’t too concerned as I’d been feeding to the left where there is a back eddy and it’s normally where the fish are holed up so after an hour, I picked up the lighter rig went over to the left and had a dace straight away but that was it which left me a bit puzzled. I tried the heavier rig in the flow again and had a couple of quick fish but as seems to be the norm in recent weeks, I was chasing the fish around. I kept trying in the deeper water at 8.5 metres but no bites and then tried 10 and then 11.5 metres and nothing. The only place I could get bites was by fishing in the flow to my left. 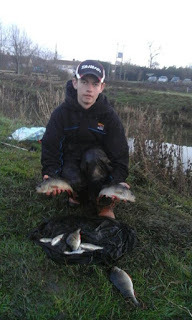 John turned up and said he was struggling and everywhere he tried, his bait was getting attacked by minnows. Then a rather boisterous young dog turned up and the owner was having a job to control it – great! I moved my pole sections out of the way and eventually they got it on the lead and went on their merry way, all the commotion did wonders for my catch rate! 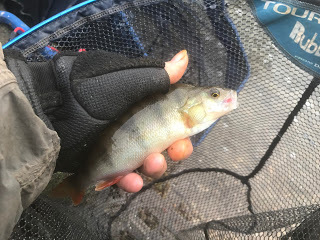 I added a little trout to my mixed bag but bites we getting less and less frequent, I was just about to try the lighter rig again, when the float buried and the strike met with solid resistance, I was convinced it would be a perch but it turned out to be a chub around the pound mark which was a nice bonus. I tried the lighter rig in the tail of the swim but no indications and as looked behind me to ship the pole back, Hurf and Big Frank were on the top of the bank watching me. I added a section and went across in the back eddy and had three dace quite quickly but the action was short lived. Frank soon got bored and went on but Hurf stayed a little longer for a chat, although I only added another minnow while he was there and he left me to it. I had a visit from another dog and then a bit later two Rottweiler’s appeared and started barking at me, so much for the peace and quiet of a days fishing! 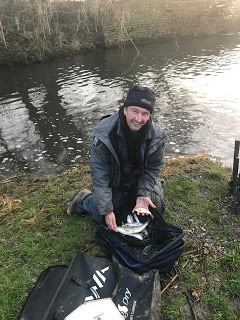 Time was running out and I knew I wouldn’t be taking home any envelopes today, I did hook a slightly better fish which was a perch around 4oz to add to my selection but I still hadn’t had a roach or one of the swims resident ruffe! Another species for my mixed bag! 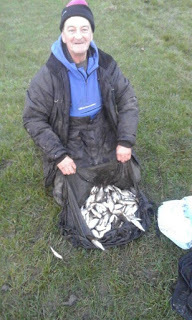 Things didn’t really improve and I ended up with 27 fish (dace, chublets, gudgeon, rudd, trout, perch) plus a few minnows. 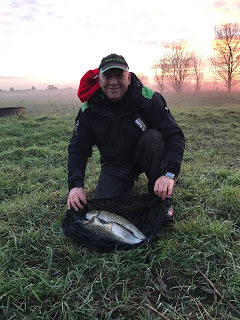 I packed up and it wasn’t long before John arrived with the scales, he said he’d caught a chub by casting the lead down towards 109 near the end as they’d been topping all day and I’d have loved to be on that peg today. 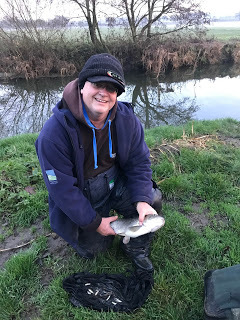 My fish weighed 3lb 7oz which was a little better than I thought, as we walked up to weigh John in, Fieldy turned up and said he’d had three chub and had bumped several too. John’s chub plus minnows went 3lb 5oz and then we walked up to Graham’s peg and he weighed 6lb 4oz. 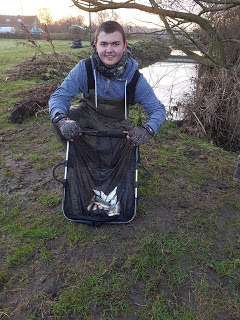 Back at the results and Isle Brewers had been tough again with Adie having the top weight there with 5lb 10oz followed by Justin with 4lb 2oz from 129 and Rich was just an ounce behind with 4lb 1oz. 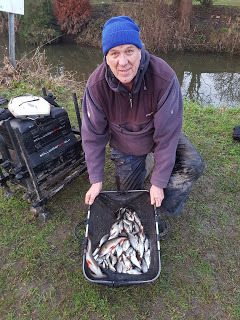 Hambridge had fished well again and is the place to draw at the moment, Steve P had the top weight with 12lb 6oz from H4 which won for the second week running and meant he also took home the golden ball money plus a pound off me. Rob had 10lb 7oz for second place, Karl had some lovely perch from H5 for 4lb 5oz and his brother Stuart had 1lb 15oz from H2. Thanks to Karl Aplin* and Rob Cox** for the photos. After four matches and dropping the worst result, Steve P leads with four points followed by Adie on six and Rob and Fieldy on seven, I’m down on nine points and today’s draw did me no favours at all! Well that’s the same three pegs that have filled the top three places in two matches on the trot, I need to draw better so perhaps a change in tactics is required, maybe for the next river match I’ll go in the bucket earlier while all the good ones are still there. 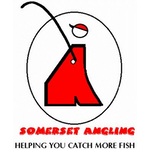 I’ve currently got fifteen booked in for the Dillington match on Wednesday 28th December, all the names are on the Facebook page, please let me know if you’re not fishing as I’ll limit it to sixteen and others might want to fish. We’ll meet out there around 8:30 ish and pools will be £15. The pond will be closed on the day.